Louise Doughty reads from Whatever You Love. 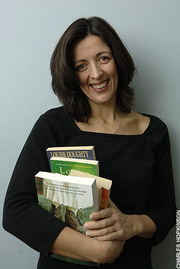 Louise Doughty is the author of six novels and has also written one work of non-fiction. Her books Fires in the Dark and Stone Cradle are based on the history of the Romany people and her own family ancestry. She's written five plays for radio and worked widely as a critic and broadcaster in the UK, and was a judge for the 2008 Man Booker Prize for fiction. Louise Doughty's book Whatever You Love was available from LibraryThing Early Reviewers. Louise Doughty is currently considered a "single author." If one or more works are by a distinct, homonymous authors, go ahead and split the author. Louise Doughty is composed of 2 names. You can examine and separate out names.